It’s somewhat of an anomaly that Stefan Goldmann’s profile isn’t writ as large as his thrilling productions. The German producer and owner of the Macro label inhabits a special place in electronic music, constantly wowing with each subsequent release, be it twelve inch, full length album, remix, or concept re-edit of Stravinsky. Even from his earliest beginnings on Derrick Carter and Luke Solomon’s Classic label it was evident Goldmann stood out from the pack, not afraid to move in his own direction and moreover always pushing himself further. It was 2005’s “Sleepy Hollow EP” that finally awakened many to his unique musical charms, and since then he hasn’t put a foot wrong, releasing a string of twelves culminated in an album that housed them all (The Transitory State) and notching up a slew of remixes that eclipsed the originals (Force of Nature’s “Sequencer” and Sideshow’s “African Cheri” immediately spring to mind). It’s less surprising, then, that the scope and sheer quality of Goldmann’s work earned him a nomination for the German equivalent of a Grammy award. But then rather than keep reading about how great we think he is, it would be much easier to check out his exclusive podcast mix and hear for yourselves. Stefan Goldmann: In my studio. I hadn’t unpacked my records from the Macro residency at Panorama Bar. It was such a brilliant night: Santiago Salazar, Raudive, Finn Johannsen, Sound Stream were all were on fire and the crowd was really into it. I had so much pleasure playing on this night, so I tried to get a bit of that vibe across in this mix. This time I went for an almost pure club mix. Theo Parrish! Because he can make a crowd scream while changing styles all the time. He can be so good at mixing the weirdest stuff together and keeping everybody dancing. People (including myself) clearly have more fun with this vibe than with any of the DJs who only play the narrowest slice of a sub-genre for hours. Theo is my favourite proof the opposite works in the hands of a skilled musician. And it’s really the better party. Also Moritz von Oswald is a hell of a DJ. I mention him because he’s very picky about where he spins, so not many people get a chance to hear him live. He really blew my mind on a Sunday last summer. There are quite a couple of people whose sets I enjoyed recently — Sven Väth’s house set when I played at his birthday party at Cocoon, for instance. On a totally different tip I need to mention Mika Vainio, who plays some of the best experimental sets I’ve ever heard. I had booked him for my Elektroakustischer Salon night at Berghain and I wasn’t disappointed. I’m still enjoying the waves the “Art Of Sorrow” single makes. Which doesn’t mean I’ve been lazy! Next up is a CD for Macro with a very special edit I did of Igor Stravinsky’s 1913 masterpiece “Le Sacre Du Printemps.” I don’t really like the idea of classics being edited, but this one is pretty different from the usual cut ups, I believe. I also just did a remix of a track that I’m really proud I could sign to Macro: Santiago Salazar’s “Arcade.” 2009 looks quite busy again, but I won’t tell you more for now! Nice! This’ll be one for the drive to Detroit. 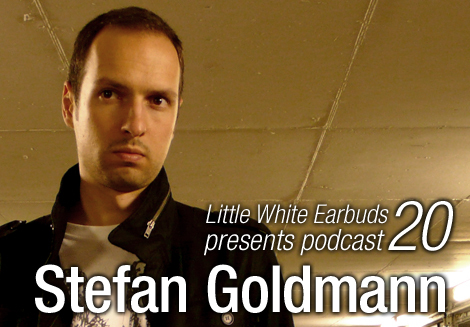 a Stephan Goldmann podcast!thank you so much guys!i really dig this guys sound…. h8 the “Biscuit” song. Other than that, pretty sweet. mix as a whole is fantastic, love the selections. also, this was my first time hearing the remix of “arcade” – seriously gorgeous sound there.